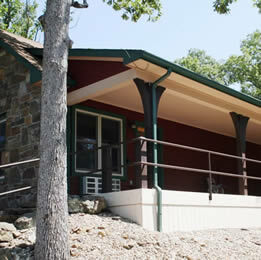 The “ Cozy Turtle” cabin was built in 2005, designed as a vacation home at Lake Tenkiller. It features two private bedrooms, a 10-foot wide wrap around covered deck and a full Kitchen with a Great Room area. The Cozy Turtle cabin is perfect for a party of 2-4 people that enjoy having the conveniences of home, plenty of space or enjoy cooking their own meals. The Cozy Turtle cabin is also perfect for extended stay reservations. Cozy Turtle 1A/KGR suite features a bedroom with queen-size bed, Kitchen/Great Room area for total living space of 709 sq. ft. and opens to 464 sq. ft. covered deck that includes patio furniture and access to a Weber grill. The bedroom has a private bathroom with a dual walk in shower and includes a large walk-in closet. The contemporary room design is complemented by a 9’ x 12’ photomural of Lake Tenkiller. The Kitchen/Great room features knotty pine wood vaulted ceiling and trim with full-size windows and glass doors. The Kitchen is equipped with an oversized refrigerator/freezer, range with a convection oven, microwave, and dishwasher. Granite counter tops along with dishes, cooking utensils, breakfast bar and dining table. It also includes a sitting area with TV and DVD/VHS combination player. Rate starts at $218 per night (single or double occupancy). Cozy Turtle 1B features a queen-size bed and private bathroom with a tub/shower combination. It is approximately 280 square feet and includes a large walk-in closet. The contemporary room design is complemented by a 9’ x 12’ photomural of Lake Tenkiller. This room also opens to a private covered deck that includes patio furniture, access to a Weber grill and leads to a beautiful natural stone and boulder stairway. Rate starts at $159 per night (single or double occupancy). Click here to compare rooms.